Kumaraswamy claimed that the former offered Rs 25 lakh along with ministerial post to his party lawmaker for shifting loyalty to the BJP. Bengaluru: Hours before presenting the budget for Karnataka, Chief Minister H D Kumaraswamy on Friday an audio clip, claiming that BJP leader B S Yeddyurappa is luring MLAs in his attempt to topple the coalition government. 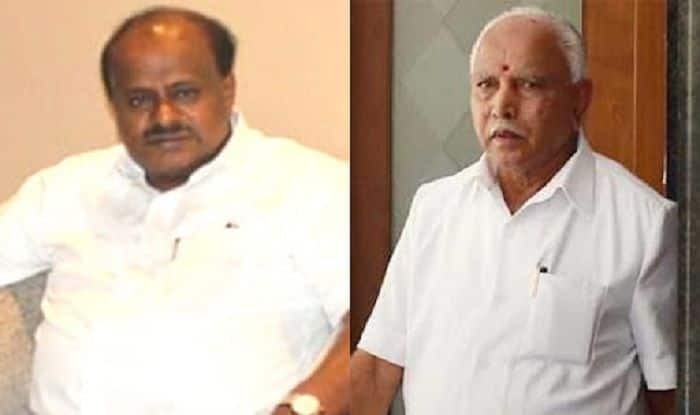 In Yeddyurappa’s purported audio clip, Kumaraswamy claimed that the former approached Naganagowda Kandkur’s son Sharana offered Rs 25 lakh along with ministerial post for his father for shifting loyalty to the BJP. The allegation by the Karnataka CM comes at a time when the coalition government is struggling with the rebel and dissenting MLAs of the Congress, who have been questioning the style of working of the chief minister. Speculations are rife that the four MLAs – Ramesh Jarkiholi, Umesh G Jadhav, B Nagendra, Mahesh Kumathalli – are in touch with the BJP and may jump ship, as they have not yet responded to the second notice issued by Siddaramaiah asking them to appear before him and explain their absence from the CLP meeting. The saffron party has already expressed doubts about budget presentation, with senior leaders like R Ashoka claiming that 20 to 25 disgruntled MLAs of the alliance were out of reach of their leaders. Kumaraswamy will read out the budget today amid protests by the BJP, whose legislators entered the well of the House for a second day, having ensured on Wednesday that governor Vajubhai Vala cut short his address to the joint sitting of both Houses. This is the first session after the cabinet expansion in December that brought to fore dissidence in the Congress and political turmoil that engulfed the state following BJP’s alleged bid to poach disgruntled legislators of the ruling coalition. The crisis last month that saw return of resort politics was triggered by a few Congress MLAs reportedly camping in Mumbai along with BJP leaders, amid reports that they might switch sides to the saffron camp.